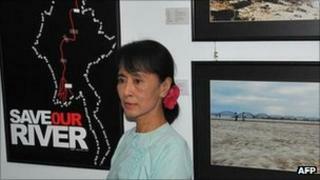 Burma's president has suspended construction of a controversial Chinese-backed hydroelectric dam. In a letter read out in parliament on Friday, Thein Sein said the $3.6bn (£2.3bn) Myitsone dam was contrary to the will of the people. The project fuelled fighting between the army and ethnic Kachin rebels. Pro-democracy leader Aung San Suu Kyi, who recently joined the anti-dam campaign, welcomed the move, seen as a rare victory for social activists. The BBC's South East Asia correspondent Rachel Harvey says it appears to be further evidence of the new leadership's desire to seek legitimacy by being more open to public opinion. The army handed over power to a civilian authority in March, although many of the new rulers are ex-military. Our correspondent says lobby groups will still be wary because Thein Sein has said he is suspending the dam's construction only for the term of his office, which ends in 2015. The Myitsone dam project was being developed jointly by Burma and China at the head of the Irrawaddy river in Burma's northern Kachin state. Kachin rebels, who have been fighting government troops in a stop-start insurgency for years, were leading the opposition to the dam. The broad campaign against the dam presented a very real test for the relatively new civilian-led, military-backed, government. It had also become a lightning rod for growing anti-Chinese sentiment in Burma. Beijing, exploiting the void created by international sanctions, has moved rapidly to exploit Burma's rich natural resources. Most of the electricity generated by Myitsone's envisaged power plant was due to go to China. Thousands of villagers would have to be resettled and some have already been forced to move. Myitsone was a huge construction project in an environmentally sensitive, earthquake prone area where armed ethnic minority Kachin fighters are battling the Burmese army, and which had become a unifying cause for the political opposition. Enough reason, it seems, for the Burmese president to call a halt. This year has been one of the most violent in Kachin state in more than a decade. The dam, which was due for completion in 2019, would be one of the world's tallest at 152m (500ft) high. The campaign against the project brought together conservationists, environmentalists, Kachin activists and the political opposition. Their objections ranged from the lack of public consultation to the potential environmental impact of the project. The dam would create a reservoir of some 766 sq km (300 sq miles) - about the size of Singapore - and displace thousands of ethnic Kachin villagers, our correspondent says. "We have to respect the will of the people as our government is elected by the people," Thein Sein said. "We have a responsibility to solve the worries of the people so we will stop construction of the Myitsone Dam during our current government." The decision to suspend construction was unexpected. Earlier this month, a report in the local Eleven journal said Electric Power Minister Zaw Min had declared that construction of the dam would proceed despite the objections. Last week, police arrested a man who staged a rare solo protest against the project outside a Chinese embassy building in Rangoon, AFP news agency reported, and a rally this week against the project was also blocked. After the decision, Aung San Suu Kyi said: "We understand the president in his memo to the national parliament has asked to suspend the Myitsone dam because of public concerns. "Since every government should listen carefully to people's voices and tackle the concerned problems, I welcome this move." The decision to halt construction was "a welcome surprise for everybody, inside and outside of Burma", Aung Zaw, editor of the Irrawaddy News website, based in northern Thailand, told the BBC. "It's the population, the whole Burmese who feel they belong to the culture heritage of the Irrawaddy river. They welcome the news." Maung Maung Than, from the BBC's Burmese service, points out that the effect of damming the Irrawaddy - which flows from the north of Burma into the massive delta in the south - would have been felt throughout the country. The vast majority of the power produced on the dam was to be exported to China, and correspondents say the dam had served to inflame growing anti-Chinese sentiment in Burma. Beijing is investing vast sums in a series of big infrastructure projects aimed at exploiting Burma's rich natural resources and geographic position in the region. There has as yet been no official reaction from China to the unusual step taken against it by its isolated ally.